You can’t query across databases in Azure SQL Database… or can you? Reference to database and/or server name in ‘DB2.dbo.DB2Table’ is not supported in this version of SQL Server. And that’s it. If I query dbo.DB2Table from DB1, I get to see data in DB2. In short, you can do a cross database query within Azure SQL Database. Yeah, it’s going to require some setup and possibly some code modifications since you can’t use the old three part naming for performing the query, but, you can do it. Further, note that these are Standard, not Premium databases. Further further, they’re not a part of an elastic pool. It’s just using the external data source and external table to connect the two databases. However, if the one thing keeping you from moving into Azure SQL Database is the ability to query across databases, that’s gone. Quick question, in your experience how does the the performance of these compare to the normal SQL Instance’s cross DB queries? I’ve found that if migrating systems which either use three part references or synonyms, the polybase (java overhead) tends to be a lot slower. Performance is not as good. It’s not as bad as you’ll sometimes hear, but it’s not very good. While we can now do cross-database queries, we still can’t assume the same kind of behavior as we would get on an instance under our direct control. It’s different and the performance is not as good. It’s not working on insert data from one database table to other database table on Azure SQL Server. Define “not working”. What error are you getting. Can you query between the two databases? This is a great write up for cross database queries on SQL Database, but there is one incorrect piece of information in it. 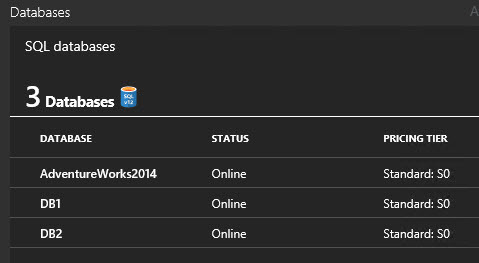 PolyBase isn’t supported on SQL Database today, only SQL Server, SQL DW, and APS. In the example above you were using Elastic Query, a feature in SQL Database that uses the same syntax as PolyBase to enable SQL to SQL connections. PolyBase today only supports SQL to HDFS connections (Azure Blobs or Hadoop Distributions). While this works it certainly doesn’t scale, in the sense that if one wanted to do a large amount of cross database querying, it is extremely cumbersome to configure all of this for access via Polybase. Are you aware of any fundamental changes to this issue that Microsoft may have in the works? Thanks for the correction and the kind words. I’ve updated the text based on your input. I appreciate the education. I don’t like to get things too wrong too often. No, I’m not aware of anything else coming up in this area. You’re correct that if there is a large amount of cross database queries this becomes cumbersome. I wouldn’t recommend using Azure in that case. However, you would want to ask why so much cross-database querying is going on. If it’s that massive a part of the process, why? Wouldn’t it make more sense to have those tables be a part of the database that they’re used so much from? Anyway, no, I’m not aware of additional work in this area. This is relatively new and the first true cross database queries of any kind that we’ve had in Azure SQL Database so far. I believe this sort of thing is going to be increasingly needed as we move more towards a self-service analytics approach – rather than nightly ETL jobs consolidating everything in once place, I expect we will simply read data directly from its native storage location. I don’t think you’re wrong. We’re going to see more and more access from the analytics, straight to the source of the data. However, it’s quite the same thing as a cross-database query. In fact, it’s kind of worse. Someone is going to be combining data from Azure SQL Database, Azure SQL Data Warehouse, and some spreadsheet somewhere, all through PowerBI and there’s going to be no way to know for sure that the data is being combined correctly. We’re living in exciting times. True, from PowerBI people can be connecting to everything and there’s not really any way I can think of to stay on top of that as an administrator. I can’t see any technical reason why we must be limited to configuring references to specific single tables one by one, do you? Of course there are many issues such as statistics involved here that Microsoft would have to consider, but I don’t see any technical reason why it isn’t achievable. That gets into a whole can of worms. Do we expose the tables or just views where we pre-join the tables for them? I’ve yet to see a definitive answer to this problem. I sure don’t have one. This is a very neat and simple way to do cross database queries (or elastics queries). I acme across a single problem though: How would you create views like this? Consider having two DBs were you wish to create a view that’ll show data from both DBs. Do you have an example that shows this? I don’t have an example like that. I’ll see what I can do. New blog post coming out on Monday with some tests around views. Hopefully that will answer your question. Yes. You can see it in the code above where I supply a UserID and Password. Do you have a question? I ask because you seem to have posted this comment multiple times. I followed above all steps to access cross database, but for the last statement it gives following error.. Can you please let me know what is the problem. Login failed on one or more shards. Please verify that the shards are accessible and that the credential information affiliated with external data source DB2Access is correct. Sorry Sushant, I don’t have anything meaningful to add beyond the fact that’s a security error, so you need to figure out why you’re getting an error on security. There has to be something wrong with the certificate set up or your secret code. I know this approach works. If you’re getting credential errors, it’s because there is an error in credentials. Grant – many thanks for this helpful post. Do you, or anyone else on here, know if there is a way to achieve cross database “Inserts” where synonyms are being used with Azure SQL? This is something that we use in our standard SQL and VM environment, but have found no way to achieve the same to be able to use Azure SQL. I don’t know. It’s not something that I’ve attempted. I haven’t heard of anyone else doing it either. The nature of Azure SQL Database pushes back somewhat against cross-database access. That one might not be possible currently. Meeting the same blocker: Login failed on one or more shards. Please verify that the shards are accessible and that the credential information affiliated with external data source DB2Access is correct. The login failure issue solved. The key is the credential you use when creating the external data source has to have permission to visit the external DB. I’m not sure. It looks like you haven’t configured things correctly. That’s not an error I’ve seen personally. In case anyone else runs into the “login failed…” situation, for me, the problem was w/ the secret value for the credential. — make sure “DB2User” actually has select rights to whatever you’re query against. Thanks Greg. It helped me. Nicely written article. Great post! I am not a DBA so forgive me if this question is too basic. What is the purpose of line 1: CREATE MASTER KEY ENCRYPTION BY PASSWORD = ‘securitymatters’;? Is it necessary? How is it being used? You have to set up encrypted security on the database in order to allow the databases to communicate with each other. The fake password I made up for this ‘securitymatters’ might be a little confusing. I just didn’t want to show what password I actually used. Thanks this help me get Cross Database Query working. Thanks for the article. Can you suggest how to access data which is in SQL Server in IaaS VMs or On-premise? At this point in time, there isn’t a way to do that. Hey Paul! Happy I could help. Thanks. Yeah for the error people were getting, the answer is correct. The credentials are an existing user on the database. You’re not creating a new user you’re just encrypting the external tables with an existing user’s credentials.